That has become a mostly irrelevant exercise in recent presidential elections. But in the event of a razor-thin finish, or a 269-vote tie, every elector will suddenly wield great power. 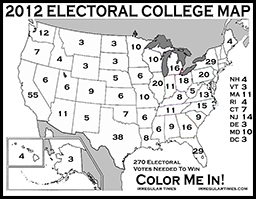 "If there appears to be a tie, then faithless electors become a big problem, and we could have a real mess on our hands," said Robert W. Bennett, a constitutional law professor at Northwestern University who has written extensively about the Electoral College. Many recent electors have mulled switching their votes and little can be done to stop them, said Robert Alexander, an Electoral College expert at Ohio Northern University. In the course of writing a book on presidential electors, Alexander interviewed more than half of the electors who participated in the 2000, 2004 and 2008 elections. Of the 2004 group, 10% said they considered voting for someone other than to whom they were pledged. In 2008, 11% said the same. Many told Alexander they were lobbied or pressured by someone to change their allegiance -- sometimes in person, sometimes by anonymous e-mails and phone calls -- in the period between Election Day and mid-December, when the Electoral College votes. "If it's really close, you would expect to see massive lobbying campaigns," Alexander said. "Most do follow the herd, but not all, and that becomes the question in a close election. What happens at the margins?" Despite being party loyalists, he said, electors are regular people with their own biases and political inclinations. In rare cases, they make them known. Throughout this past spring and summer, Ron Paul's devoted supporters worked furiously to elect their own as electors at state party conventions. "They are trying to be the revolution to the Electoral College," Alexander said. Change comes slowly. But, if I had a list, the electoral college just might be on it. A 269-269 tie might lead to changes. The prospect of electors suddenly being bribed to cross over is a bit disconcerting. The EC is not without advantages. One thing it does is, in a close election, any recounts are going to be confined to a few states. In a straight popular vote system, say the vote is only a few thousand apart, you can end up recounting the vote in every precinct in the U.S. It would be a chaotic mess. Those who say the EC has operated exactly as intended, have it wrong. It was intended to be a deliberative body, a body of wise men who would make an informed, educated decision on who should be President. It matters not how you vote in November in the presidential races....that will be determined by the delegates, not YOU! I wish Americans would wake up and pay attention to their state reps and city council races and give less attention to the presidential race where they have literally NO influence. But Americans are still mostly sheep.